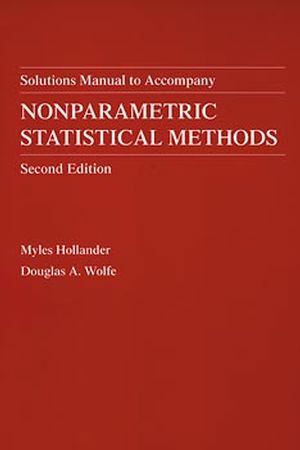 The importance of nonparametric methods in modern statistics hasgrown dramatically since their inception in the mid-1930s.Requiring few or no assumptions about the populations from whichdata are obtained, they have emerged as the preferred methodologyamong statisticians and researchers performing data analysis.Today, these highly efficient techniques are being applied to anever-widening variety of experimental designs in the social,behavioral, biological, and physical sciences. * Contingency tables and the odds ratio. * Life distributions and survival analysis. * Nonparametric methods for experimental designs. * More procedures, real-world data sets, and problems. * Illustrated examples using Minitab and StatXact. An ideal text for an upper-level undergraduate or first-yeargraduate course, this text is also an invaluable source forprofessionals who want to keep abreast of the latest developmentswithin this dynamic branch of modern statistics. MYLES HOLLANDER is Robert O. Lawton Distinguished Professor ofStatistics at Florida State University in Tallahassee. He served aseditor of the Theory and Methods Section of the Journal of theAmerican Statistical Association from 1993-96. DOUGLAS A. WOLFE is a Professor of Statistics at Ohio StateUniversity in Columbus. He is a two-time recipient of the OhioState University Alumni Distinguished Teaching Award, in 1973-74and 1988-89. The Two-Sample Dispersion Problem and Other Two-SampleProblems. Life Distributions and Survival Analysis.